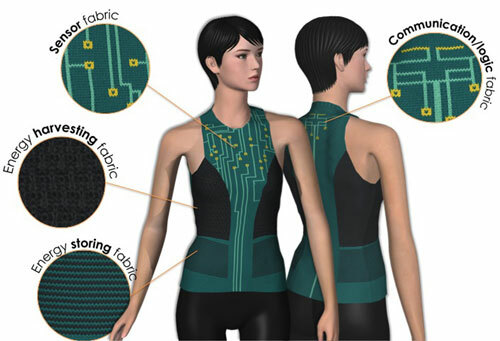 (Nanowerk News) While the pattern for making a wearable fabric battery has already been laid out, it’s now time to select the threads that will turn a textile into an energy storage device. That process is being driven by Drexel University doctoral student Kristy Jost, who’s threaded her way into the forefront of research on conductive yarns. Using a process, called “Natural Fiber Welding,” which was developed by collaborator Paul C. Trulove at the U.S. Naval Academy, researchers are embedding functionalized materials—at the molecular level—into a cellulose-based yarn, like cotton. Jost, who is advised by Yury Gogotsi, PhD, Distinguished University and Trustee chair professor in the College of Engineering and Genevieve Dion, director of the Shima Seiki Haute Technology Laboratory and an assistant professor in the Antoinette Westphal College of Media Arts & Design, has taken this process to the next level. She and her team are using NFW to strategically alter yarn for a variety of uses, but the one they’re most interested in is energy storage. Using industrial knitting machines in the Shima Seiki Haute Technology Laboratory, Drexel researchers are searching for the best capacitive yarn to use in energy storage textiles. “If energy textiles are going to be realized, figuring out the best way to functionalize our yarn is the first step,” Jost said. “Natural fiber welding is proving to be highly effective in producing yarns that we can tune for particular uses, including energy storage. This work is only possible because of the successful collaboration between Drexel’s Shima Seiki Haute Tech Laboratory, the A.J. Drexel Nanomaterials Institute, and the chemistry department at the U.S. Naval Academy. To make it happen, the yarn is first treated with a molten salt, which causes the polymer chains to swell, thus opening the structure. Then they embed it with a functional material—such as activated carbon particles—by sliding the yarn through a syringe filled with a mixture of the material in the ionic liquid. The yarn is then pulled through the needle of the syringe, which physically presses the carbon into the fibers, and it is wrapped onto a spool. The ionic liquid is removed by washing the yarn with water, which also re-solidifies the cotton fiber, trapping carbon particles in the surface. The result is a complex composite fibrous material that retains its original flexibility, but gains the capacitive properties of activated carbon. Much like conventional energy storage devices have metal plates to improve the electrical conductivity, the activated carbon-natural fiber welded yarn is twisted with a highly conductive stainless steel yarn prior to testing. Activated carbon on it’s own is not conductive enough for energy applications, so the stainless steel yarn allows the materials to be charged more easily. Drexel researchers have developed an effective process for coating yarn with activated carbon and twisting it with stainless steel to make it capacitive. 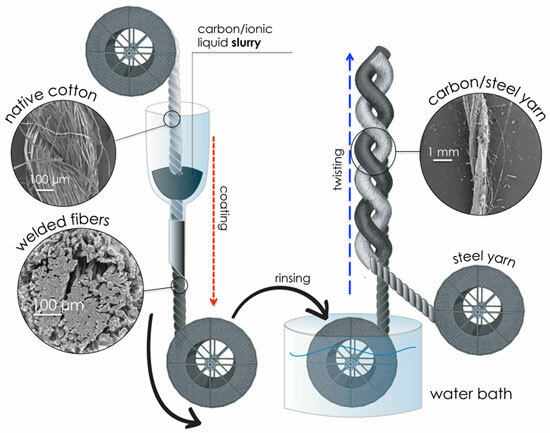 This technique for embedding carbon particles into cellulose yarn is an important step on the way to producing energy storage textiles. That development is taken even further in a paper recently published in Advanced Energy Materials ("Flexible Electronics: Natural Fiber Welded Electrode Yarns for Knittable Textile Supercapacitors") where several types of conductive yarn are tested and knit into full fabrics capable of storing energy using industrial knitting machines at the Shima Seiki Haute Technology Lab. Jost and her team saw this challenge play out in front of them as they moved from the creation of capacitive yarn to attempting to knit with it. The best capacitance results, which were on par with conventional supercapacitors, came from the cotton yarn twisted with steel prior to welding. The ultimate goal for Drexel's capacitive yarn is to knit full textiles that can store energy. So the group moved on to test bamboo, linen and viscose/nylon blended yarns in hopes of finding a more durable combination. And while none of the three other yarn types produced the same high level of electrochemical performance as the cotton-based yarn, they were all strong enough to be knitted into a fabric without breaking. “We believe that the longer fibers found in bamboo, linen and viscose yarns contributed to their strength and made them less likely to pull apart during the knitting process,” Jost said. The team, in concert with researchers at the A.J. 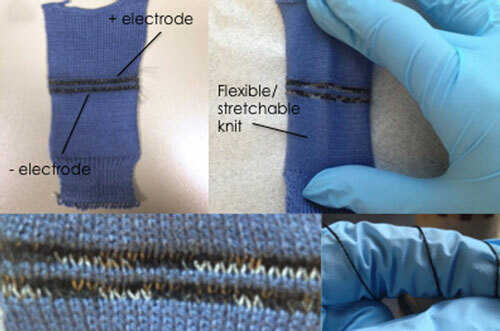 Drexel Nanomaterials Institute, is already developing knitted supercapacitors, while continuing to use explore new materials and fabrication processes.